The Bureau's 5pm update has confirmed TC Iris has weakened to a Category 1 system, but still packing 120km/h wind gusts. "Tropical cyclone Iris has weakened during the past few hours and is now a category 1 cyclone. During the past few hours, Iris has turned in a more east-southeasterly direction and moved slightly further away from the coast," the bureau's advice reads. "Iris is expected to continue on its current track tonight, while weakening further. On Thursday, Iris should weaken below tropical cyclone intensity and slow down offshore of the Central Coast, before adopting a track back towards the northwest as a tropical low during Friday." Gales with damaging wind gusts in excess of 100km/h are beginning to ease about the Whitsunday Islands as the cyclone weakens and moves further away, the bureau says. However, gales could redevelop about the Whitsunday Islands and exposed coastal areas between Bowen and Shoalwater Bay tonight if the cyclone takes a more southerly track than expected. Heavy rainfall, which could lead to flash flooding, is becoming increasingly unlikely as the cyclone weakens and moves further away from the coast. However, heavy rainfall may still develop about coastal parts of the central Queensland coast tonight or on Thursday if the cyclone takes a more southerly track than expected. A Flood Watch is current for coastal catchments between Ayr and St Lawrence. HEAVY rainfall and damaging winds are still expected along the Mackay and Whitsunday coast today, as Tropical Cyclone Iris continues to move down the coast. The Bureau of Meteorology's 11am advice says TC Iris is still a Category 2 system, with winds near the centre of 95km/h with wind gusts to 130km/h. The system is about 190km northeast of Hamilton Island and 240km north northeast of Mackay and it's moving south southeast at 12 kilometres per hour. "Tropical cyclone Iris is expected to continue on its current southeasterly track during today, while gradually weakening," the advice reads. "On Thursday, Iris should weaken below tropical cyclone intensity and slow down offshore of the Central Coast, before adopting a track back towards the northwest as a tropical low during Friday." The Bureau advises people in the Whitsunday Islands and adjacent coastal areas to remain inside until the cyclone has passed. TROPICAL Cyclone Iris is moving about nine kilometres an hour down the Queensland coast, packing wind gusts of up to 130 kilometres an hour. Just after 5am, the Bureau of Meteorology said it was located within 75 kilometres of 18.7 degrees South 150.2 degrees East, estimated to be 225 kilometres northeast of Hamilton Island and 295 kilometres north northeast of Mackay. "Tropical cyclone Iris is expected to continue on its current southeasterly track during today, while gradually weakening to category 1 intensity," the official BOM advice said. "Iris is currently forecast to weaken below tropical cyclone intensity and become slow-moving offshore of the Whitsunday Islands on Thursday, before adopting a track back towards the northwest during Friday." Gales are occurring about the Whitsunday Islands, and may develop about remaining coastal and island communities between Bowen and St Lawrence, including Mackay and Sarina, today. The gales may extend south to Yeppoon on tonight. Heavy rainfall, which could lead to flash flooding, may develop about parts of the central Queensland coast today. A Flood Watch is current for coastal catchments between Ayr and St Lawrence. 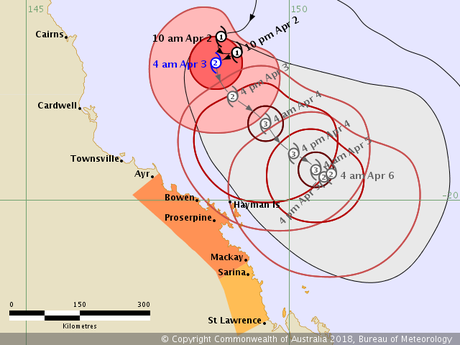 People in the Whitsunday Islands and adjacent coastal areas should remain inside until the cyclone has passed and listen to the next advice at 8am. People in remaining areas between Bowen and Yeppoon, including Mackay, should take precautions and listen to the next advice. TROPICAL Cyclone Iris is continuing to move southeast down the Queensland coast with wind gusts of up to 130 kilometres an hour. The Bureau of Meteorology said a warning zone remained from Bowen to St Lawrence, including Mackay and the Whitsunday Islands. The Watch Zone is from St Lawrence to Yeppoon. At 1am, Iris was a Category 2 system with winds near the centre of 95 kilometres per hour and gusts up to 130km/h. It was estimated to be 355 kilometres east northeast of Townsville and 300 kilometres north northeast of Mackay. It was moving about 10 kilometres an hour. Tropical cyclone Iris is expected to continue on its current southeasterly track until Thursday, the bureau said. "The system may gain in intensity a little this morning, but is now not likely to become a severe category 3 cyclone. "On Thursday, the cyclone should slow down and begin to weaken. It may reverse direction and adopt a track to the northwest overnight Thursday or on Friday as a weak category 1 or remnant tropical low. "The cyclone is not expected to cross the Queensland coast in the short to medium term, but may approach the coast close enough to produce significant impacts." DESTRUCTIVE WINDS are occurring close to the core of the cyclone. These DESTRUCTIVE WINDS may impact the coastal fringe and islands between Bowen and Mackay, particularly the Whitsunday Islands, during this morning if the cyclone takes a more southerly track than expected. GALES are being observed about the Whitsunday Islands, and may develop about remaining coastal and island communities between Bowen and St Lawrence, including Mackay and Sarina, early this morning. These GALES may then extend south to Yeppoon on Wednesday night or Thursday. Heavy rainfall, which may lead to flash flooding, may develop today, chiefly about the Central Coast and Whitsundays district. A Flood Watch is current for coastal catchments between Ayr and St Lawrence. People in the Whitsunday Islands and nearby inland should remain inside until the cyclone has passed and listen to the next advice at 2 am Wednesday. People in remaining areas between Bowen and Sarina including Mackay, and adjacent inland areas, should immediately commence or continue preparations, especially securing boats and property using available daylight hours. People between Sarina and St Lawrence should consider what action they will need to take if the cyclone threat increases. Tropical Cyclone Iris is still tracking parallel to the Queensland coast as a Category 2 storm, with sustained winds near the centre of 95kmh with wind gusts to 130kmh. The system is about 340km east northeast of Townsville and 325km north northeast of Mackay moving southeast at 10kmh. The Bureau says Cyclone Iris is expected to continue on its current southeasterly track until Thursday. "The system may gain in intensity a little overnight into Wednesday morning, but is now not likely to become a severe category 3 cyclone," the 11pm update reads. "On Thursday, the cyclone should slow down and begin to weaken. It may reverse direction and adopt a track to the northwest overnight Thursday or on Friday as a weak category 1 or remnant tropical low." Meanwhile a wind gust of 104kmh was recorded at Hamilton Island at 10.30pm as the system lashes the North Queensland coast. The Bureau has warned that TC Iris is "intensifying" as it continues to whirl along the Queensland coast. As of 7pm, the system is still classed as a Category 2 system, it's expected to continue on its current southeast track until Thursday, and should intensify further. The Bureau says on Thursday the cyclone should slow down and begin to weaken. It may reverse direction and adopt a track to the northwest overnight Thursday or on Friday. "The cyclone is not expected to cross the Queensland coast in the short to medium term, but may approach the coast close enough to produce significant impacts," the bureau says. People between Bowen and St Lawrence, including Mackay and the Whitsunday Islands, should complete preparations quickly, especially securing boats and property. Meanwhile Mackayites are already stocking up on their cyclone supplies, cleaning out many grocery stores across the region of its bread and milk. Tropical Cyclone Iris has shifted south in the bureau's latest update, with the cyclone warning cancelled for Ayr to Bowen, with Yeppoon now included in the warning zone. TC Iris is still classified a Category 2 system, located 320km east northeast of Townsville and 365km north of Mackay. "Tropical cyclone Iris is expected to continue moving southeast, parallel to the Queensland coast, for the next two days and may intensify further during this period," the BOM's cyclone advice reads. "On Thursday the cyclone should slow down and begin to weaken. It may reverse direction and adopt a track to the northwest overnight Thursday or on Friday. Some weather chasers monitoring a number of models have released track maps of their own, including Mackay and District Weather Updates which shows the system turning back towards the coast and heading north before weakening. 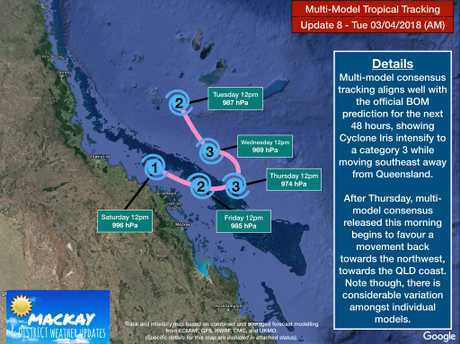 Mackay & District Weather Updates released a forecast track map based on a number of models. They said "after Thursday, computer models start to differ widely between one another, however, there is a general consensus between models that Cyclone Iris will begin to move back towards the west to northwest, towards Queensland". DESTRUCTIVE WINDS are occurring close to the core of the cyclone. These destructive winds may impact the coastal fringe and islands between Bowen and Mackay, particularly the Whitsunday Islands, from early Wednesday morning if the cyclone takes a more southerly track than expected. GALES are beginning to occur about the Whitsunday Islands, and may develop about remaining coastal and island communities between Bowen and St Lawrence, including Mackay, overnight tonight or on Wednesday. These GALES may then extend south to Yeppoon on Wednesday night or Thursday. Heavy rainfall, which may lead to flash flooding, may develop tonight or on Wednesday, chiefly about the Central Coast and Whitsundays district. A Flood Watch is current for coastal catchments between Ayr and St Lawrence. The next update is expected to be released at 8pm Tuesday. MACKAY Mayor Greg Williamson is warning residents to "be prepared, but not to strip Coles and Woolies' shelves bare" as Cyclone Iris bears down on North Queensland. "As we know, Cyclone Iris has done a very merry little dance around the Coral Sea over the past three or four days and at this stage, for the next 48 hours, we believe that Cyclone Iris will travel south and intensify as it goes. "We had a state meeting this morning with the Premier (Annastacia Palaszczuk) chairing it, from the State Disaster Control Centre." Meanwhile, at least 50 members of Mackay SES will be on stand-by in coming days, with outside help available if needed. State Emergency Service (SES) Local Controller Selina Neill has her fingers crossed Tropical Cyclone Iris and associated weather won't cause too much chaos. But her team is at the ready to respond if need be, and it has already spent time attending to leaky roofs and preparing sandbags for residents in recent days. "We have three flood boats on standby to work in conjunction with (Queensland Fire and Emergency Services) Swiftwater Rescue," Ms Neill said. "We have just been, basically, assessing our stocks and making sure we are ready to be able to respond to any calls from the community." Tropical Cyclone Iris remains a Category 2 system as of 1pm Monday, with sustained winds of 95km/h with wind gusts to 130km/h. TC Iris is estimated to be 335km norteast of Townsville and 420km north of Mackay and moving at 6km/h. "Tropical cyclone Iris is expected to continue moving southeast, parallel to the Queensland coast, for the next two days and may intensify further during this period," the latest BOM advice reads. Destructive winds are occurring close to the core of the cyclone. These destructive winds may impact the coastal fringe and islands between Bowen and Mackay, including the Whitsunday Islands, from early Wednesday morning if the cyclone takes a more southerly track than expected. GALES may develop about coastal and island communities between Ayr and Sarina, including Mackay and the Whitsunday Islands, from this evening or early Wednesday morning. These gales may then extend south to St Lawrence later on Wednesday. Heavy rainfall which may lead to flash flooding may develop during Tuesday and Wednesday. A Flood Watch is current for coastal catchments between Ayr and St Lawrence. The Mackay Local Disaster Management Group will meet at 1.30pm today to talk preparedness as Cyclone Iris continues to intensify in the Coral Sea. Travellers in the Whitsundays are leaving the region in droves, as memories of Cyclone Debbie 12 months ago linger in town. So far today, the system has delivered very little rain, but the rivers and creeks around Mackay and Whitsundays are already swollen with the 24 hour totals already delivering more than 100mm in a number of areas. Meanwhile, Kinchant, Eungella and Teemburra dams are rapidly approaching maximum capacity after heavy rain associated with Cyclone Iris. Kinchant Dam is 80 per cent full after yesterday's downpour pushed up water levels by 3.5 per cent. Check out the dam levels HERE. Meanwhile, the Bureau of Meteorology has said there was "a significant change in forecast policy" for Tropical Cyclone Iris about 11pm last night. Via Twitter, the Bureau said "The first TC Advice was issued at 11.42pm unfortunately later than the scheduled 11pm issue time. From 5am TC Advices are being updated 3-hourly while cyclone warnings are current". It comes after Whitsunday MP Jason Costigan and Dawson MP George Christensen took the bureau to task with the lateness of the update as the weather system intensified. TROPICAL Cyclone Iris has strengthened, with the Bureau of Meteorology issuing a warning for some parts of the Queensland coast. Gale force winds have been predicted from Ayr to Mackay, including the Whitsundays, with a watch zone issued for residents from Mackay to St Lawrence further south. "Tropical cyclone Iris has continued to intensify while moving slowly south overnight and is now a category 2 cyclone," the bureau said early today. "Iris is expected to continue moving slowly to the south through most of today while continuing to intensify, before curving more to the southeast, parallel to the Queensland coast, on Wednesday. The storm intensified back to cyclone strength yesterday morning, prompting authorities to move rescue crews and SES members into place ahead of another expected drenching. A severe weather warning was also issued between Townsville and Mackay. A TROPICAL cyclone warning has been declared for parts of the Lower Burdekin, Central Coast & Whitsunday Islands. Areas affected include Ayr to Mackay, including the Whitsunday Islands, the Bureau of Meteorology said in an advice just after 5am on Tuesday. A Watch Zone extends from Mackay to St Lawrence. At 5am, Tropical Cyclone Iris was a Category 2 system with sustained winds near the centre of 100 kilometres per hour with wind gusts to 140 kilometres per hour. Cyclone Iris' predicted path early Tuesday morning. It was located within 55 kilometres of 17.4 degrees South 148.6 degrees East, estimated to be 310 kilometres east of Cairns and 285 kilometres northeast of Townsville. It is moving south at 6 kilometres per hour. "Tropical cyclone Iris has continued to intensify while moving slowly south overnight and is now a category 2 cyclone,'' the bureau said. "Tropical cyclone Iris is expected to continue moving slowly to the south through most of today while continuing to intensify, before curving more to the southeast, parallel to the Queensland coast, on Wednesday. "At this stage, the cyclone is not expected to cross the Queensland coast but may approach the coast close enough to produce significant impacts. DESTRUCTIVE WINDS extend outwards to 100 kilometres from the centre and may impact the coastal fringe and islands between Bowen and Mackay, including the Whitsunday Islands, from early Wednesday morning. GALES extend outwards to around 150 kilometres from the centre and may develop about coastal and island communities between Ayr and St Lawrence, including Mackay and the Whitsunday Islands, from this evening or early Wednesday morning, then extend south to St Lawrence later on Wednesday. Heavy rainfall which may lead to flash flooding may develop during Tuesday and Wednesday. A Flood Watch is current for coastal catchments between Rollingstone and St Lawrence. People between Ayr and Mackay, including the Whitsunday Islands, should immediately commence or continue preparations, especially securing boats and property [using available daylight hours]. 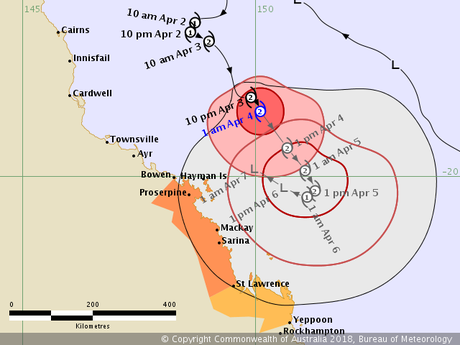 People between Mackay and St Lawrence should consider what action they will need to take if the cyclone threat increases. A severe weather warning has been issued for destructive winds and heavy rainfall for people in parts of the Central Coast and Whitsundays, Herbert and Lower Burdekin forecast districts. "At 10pm Tropical cyclone Iris (Category 1) was located approximately 320km northeast of Townsville and moving slowly south southwest. It is expected to move southward and track closer to the coast and intensify to a Category 2 during Tuesday," the bureau's warning reads. "Damaging and destructive wind gusts may develop within the warning area associated with the inner core of Tropical cyclone Iris. "A Tropical Cyclone Advice has been issued for Tropical Cyclone Iris. A watch zone is current for the coast between Ayr to St Lawrence." Damaging winds, with peak gusts in excess to 90km/h, may develop about the coast, islands and higher terrain within the warning area between Ayr and St Lawrence during Tuesday morning well ahead of the approach of the cyclone. "Heavy rain, which may lead to flash flooding, is also possible between Ayr and Sarina is expected to develop later on Tuesday. Six hour totals of 150 to 200mm are possible," BOM warns. A Flood Watch for coastal catchments between Rollingstone and St Lawrence is current. Locations which may be affected include Mackay, Proserpine, Bowen, Airlie Beach and Hamilton Island. A tropical cyclone watch has been declared for tropical cyclone Iris. As of 11.45pm Monday, the Bureau of Meteorology advised the 'watch zone' includes Ayr to St Lawrence, including Mackay and the Whitsunday Islands. Cyclone Iris is currently a Category 1, sustained winds near the centre of 75 kilometres per hour with wind gusts to 100 kilometres per hour and is about 345 kilometres east of Cairns and 325 kilometres northeast of Townsville. It's moving south at 6 kilometres per hour. Tropical cyclone Iris redeveloped in the Coral Sea off of the tropical Queensland coast earlier Monday morning, and has been moving slowly southwards and intensifying during Monday. Tropical cyclone Iris is expected to continue moving slowly to the south during Tuesday while continuing to intensify, before curving more to the southeast, parallel to the Queensland coast on Wednesday. At this stage, the cyclone is not expected to cross the Queensland coast, but may approach the coast close enough to produce significant impacts. Gales extend outwards to 150 kilometres from the centre and may develop about coastal and island communities between Ayr and St Lawrence, including Mackay and the Whitsunday Islands, early Wednesday morning. Oz Cyclone Chasers shows the latest track map shows a "less sharp easterly shift which takes it marginally closer to the coast". "As mentioned there is modelling from this afternoon that takes the system close enough to extend the gale force wind radius onto the coast along the Whitsundays and Mackay," they said. "It is certainly one to keep an eye on and with the unpredictability of it so far more intriguing developments may occur yet." People between Ayr and St. Lawrence, including Mackay and the Whitsunday Islands, should consider what action they will need to take if the cyclone threat increases.